The way the US economy grows and recovers overwhelmingly benefits the rich and powerful. Do the majority of Americans share in the benefits of economic recoveries? Does a rising tide, as we are often told, lift all boats? It turns out that since World War II, every expansion has delivered a smaller and smaller share of the gains in income growth to the bottom 90% of families. Even worse, in the latest expansion, while the economy has grown and average real income has recovered from its 2008 lows, all of the benefits have gone to the wealthiest 10% of families, while the income of the bottom 90% has fallen (Figure 1). We have thus reached a situation where a rising tide sinks most boats. Figure 1. 90 Percent vs. 10 Percent: Distribution of Average Income Growth during Expansions (Including Capital Gains). 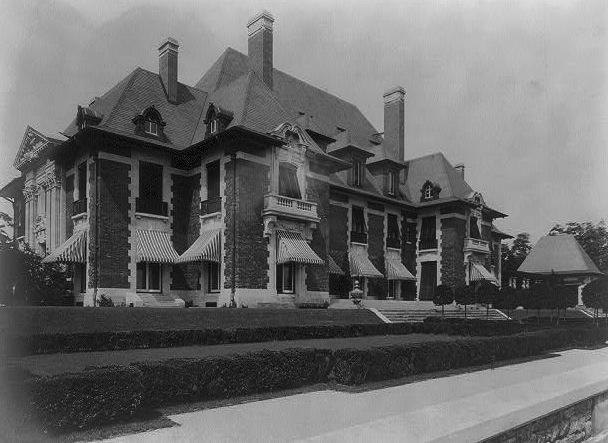 But not all wealthy families are created equal. 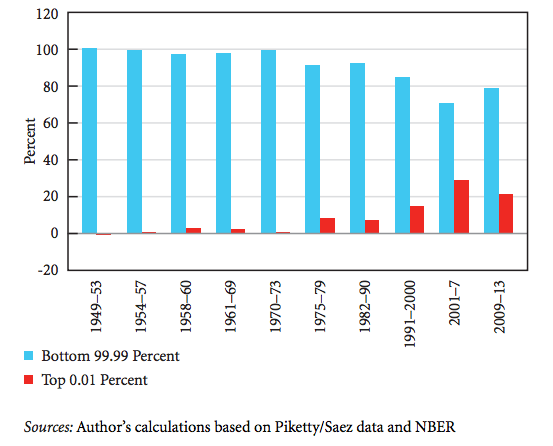 Decomposing the top 10% further, we can see that during the last two expansions (2009–2013 and 2001–2007), the wealthiest 1% of families captured 76% of the growth pie in each expansion (Figure 2), whereas the richest 0.01% captured a 21% and 30%, respectively (Figure 3). A stunning one-fifth to one-third of all income growth has gone to a tiny sliver of the wealthiest families in the United States during those periods. Figure 2. 99 Percent vs. 1 Percent: Distribution of Average Income Growth during Expansions (Including Capital Gains). Any seeming and marginal “improvement” in the trend observed during the last expansion (Figures 2 and 3) is due to the way the rich have pulled income forward to 2012, reporting artificially low 2013 incomes when a series of preferential tax treatments on capital gains expired. The data also show that incomes for the bottom 99% have remained flat in 2013, meaning that the statistical improvement in the trend is not due to an improvement in the well-being of the bottom 99% of households. The wealthy have greater discretion over the size of their income, since a greater proportion of it is composed of capital gains and they can elect to realize these gains at different times. So we can look at the distribution of income growth once capital gains have been excluded. Figure 4. 99 Percent vs. 1 Percent. Distribution of Average Income Growth during Expansions (Excluding Capital Gains). During 2009–13, the wealthiest 1% of families captured more than 100% of the income growth (Figure 4). 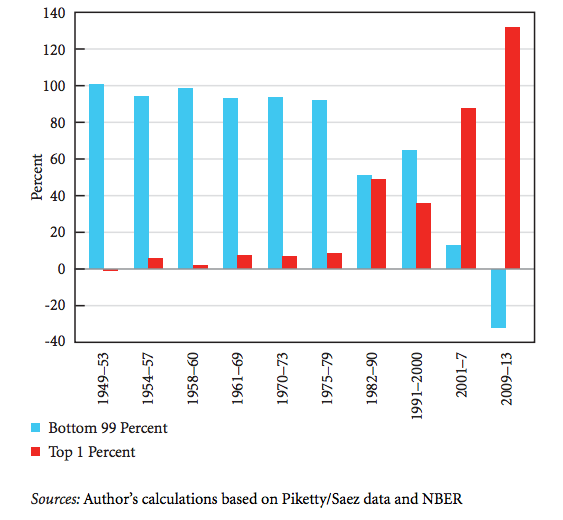 In other words, the market incomes of the bottom 99%, excluding capital gains, dropped during the 2009–13 expansion. The same is true for the bottom 90% (not shown), whose average real incomes fell from $31,600 in 2009 to $30,980 in 2013, while the incomes of the wealthy 10% rose. Comparing Figure 2 to Figure 4, the distribution of income growth appears less unequal when capital gains are included. At first, this may seem like a counterintuitive result. But what the data illustrate is that even though capital gains are a very small share of income for the bottom 99% of families (only about 2% of their income comes from capital gains), capital gains are the difference between a shrinking income and a marginally growing income for these families. Without capital gains, average real income for the bottom 99% fell by $127 from 2009 to 2013; including them it rose by a meager $451. For the rich, however, average incomes grew with or without capital gains, even though the latter make up a proportionately larger share (between a quarter and a third) of their income. Capital gains contributed $91,444 to their average income growth. In essence, the bottom 99% are counting on their very small capital gains to keep themselves afloat, because their shrinking wages are not doing the job. So far we have only looked at who benefits from economic expansions. But what happens over the business cycle? Is it not the case that the wealthy lose disproportionately more of their income during downturns? The answer: yes they do, but their income also recovers with lightning speed, whereas the income for the majority of families in the US increasingly is not even restored. The GDP cycle and real income cycle data do not correspond perfectly, but they are very close (for full set of figures, see here). Both cases confirm that the trend toward greater inequality is even more apparent over the entire economic cycle (GDP or income). 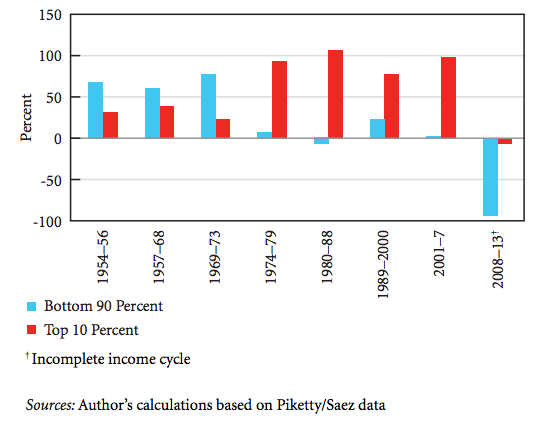 Worse, since the ’70s, the incomes of the rich have recovered almost immediately after downturns, capturing the overwhelming majority (and sometimes all) of the income growth from the year after the peak of the income cycle to the next peak (Figure 6). Two disturbing phenomena are evident from the business cycle data. 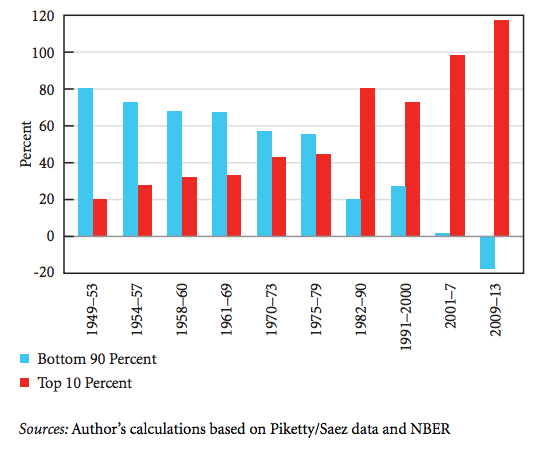 First, since 2000, the incomes of the bottom 90% have fallen during each cycle (Figure 5). 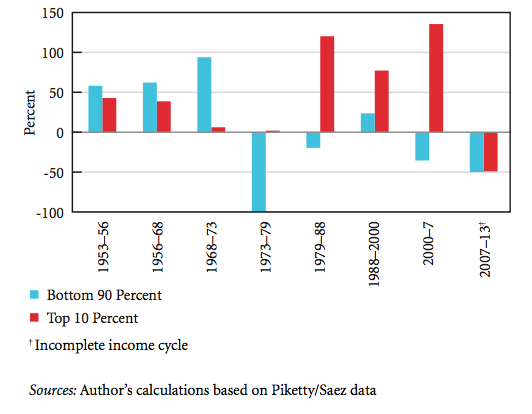 Second, the way the US economy grows recovers the income of the wealthy first (Figure 6). Consider what happens to the distribution of income growth from one year after the peak of the income cycle until the subsequent peak (Figure 6). Starting in the ’70s, only one year after a downturn, the cycle delivers between 78% and 107% of the income growth to the wealthiest 10% of families. During the last period, from 2007–2013, average real income in the economy shrank, and those losses were shared about equally between the bottom 90% and top 10% (Figures 4 and 5). 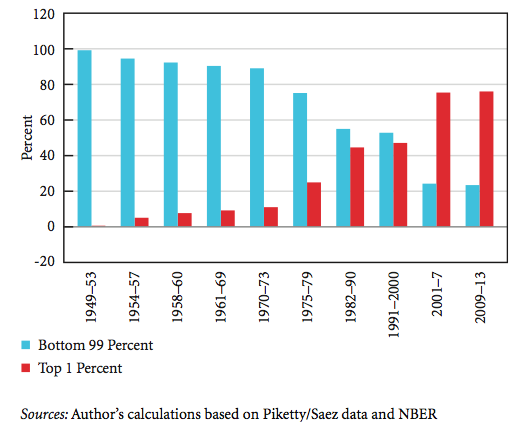 But during 2008–13 (Figure 6), income for the bottom 90% fell proportionately more than that for the wealthiest 10%, meaning that incomes of the latter turned around more rapidly (even though they are still below their 2007 highs). Indeed, during 2009–13, real average income for the wealthiest 10% of households rose by 12% (not shown), while for the bottom 90% it was still falling. This quick turnaround in the incomes of the wealthy has been the norm for the majority of economic cycles since the mid-1970s. These data again confirm that the way our economy grows benefits the rich and powerful. The good news is that maldistributed wealth is not the inevitable result of globalization or technology or a skills gap. As I have shown elsewhere, it is most directly influenced by government policy and the way it stabilizes the economy. With a reorientation in policy, these trends in income inequality can be turned around in a more equitable direction. Republished from Levy Institute . Pavlina R. Tcherneva is an assistant professor of economics at Bard College and a research associate at the Levy Institute. The following piece is adapted from a Levy Institute policy report.